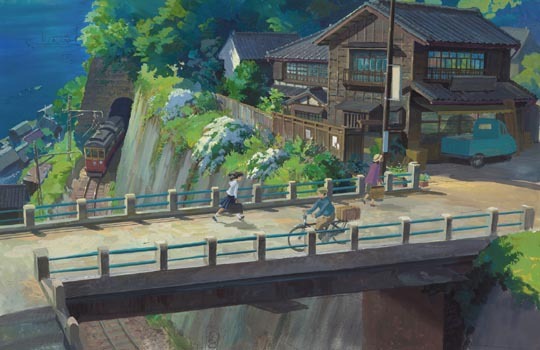 Japan’s legendary Studio Ghibli is, of course, best known for the epic animated fantasies of Hayao Miyazaki. Although most of these films focus on young characters with appeal to children, the films themselves are complex and deal with serious, mature themes. 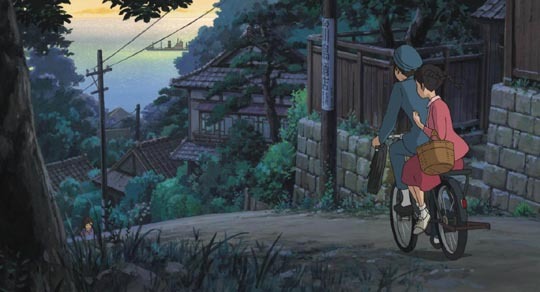 Less prominent are a handful of films which have no fantasy elements – in fact, they could all easily have been made as live-action features, although the use of the expressive possibilities of animation gives them an emotional power that live action might diminish: Isao Takahata’s devastating Grave of the Fireflies, about two young children struggling to survive in the final days of World War Two; Takahata’s Only Yesterday, an emotionally resonant story about a young woman reconnecting with her past on a trip from Tokyo to a rural area she visited as a child; and the minor I Can Hear the Sea by Tomomi Mochizuki, essentially a teen romance. 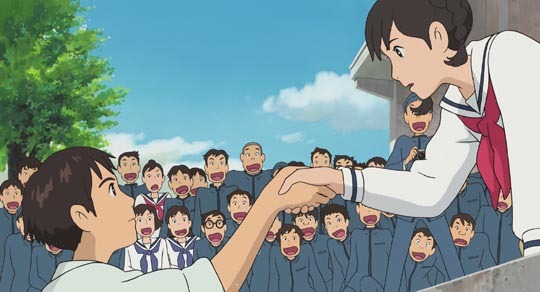 The new Ghibli feature, From Up On Poppy Hill (released on Blu-ray and DVD by Cinedigm/GKids), belongs to this category; there are no fantasy elements in the story, but the richness of the design and photography imbue the story of a tentative romance between two high school students in Yokohama in 1963 with a deep sense of nostalgia which makes the film’s evocation of Japan’s past as engaging as the imaginary landscapes of Miyazaki’s epics. 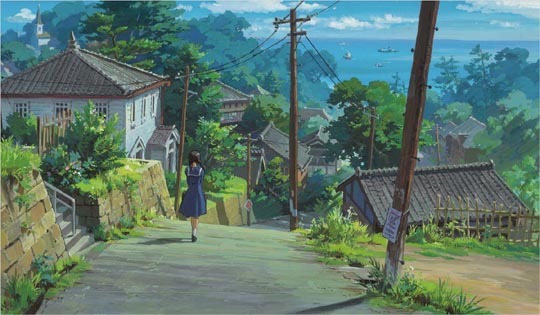 Umi is a highschool girl who lives in a big old house on a hill overlooking Yokohama harbour. Every morning, she raises a signal flag as a symbolic guide for the father who died years ago when his supply ship was sunk by a mine during the Korean War. The house is now full of boarders and Umi cooks the meals for everyone, and looks after her younger siblings while their mother is away studying in the U.S. 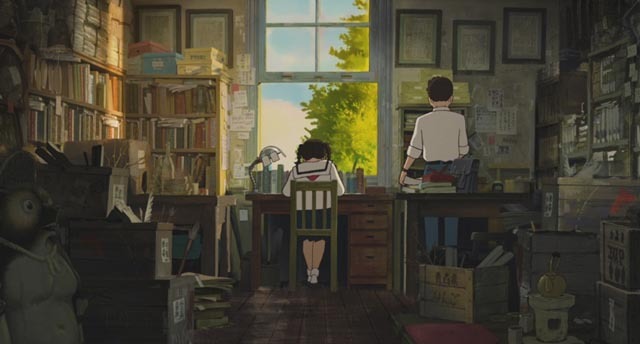 The film’s plot is simple: Umi and Shun, a boy at her school, become attracted to each other just as the administration orders that a ramshackle old mansion used as a student clubhouse (as in astronomy club, philosophy club, literature club, etc, plus the student newspaper) has to be torn down. The place is undeniably a dump, as none of the all-male club members have ever attempted to do any cleaning. But under Umi’s practical influence, and with the help of the girl students, the old building is cleaned up and restored in an attempt to persuade the authorities to spare it. This all takes place as Japan attempts to free itself from the weight of its past, particularly the lingering effects of the war and the troubled reconstruction which followed. Preparations are underway for the next year’s Tokyo Olympics and much of society is determined to wipe away the past and invent a new future. 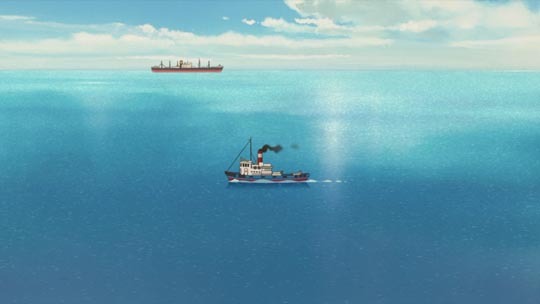 But Umi, through her own connection with her absent sea captain father, understands that a connection to the past is essential to a sense of identity, that rather than wiping everything away, the past must be come to terms with. 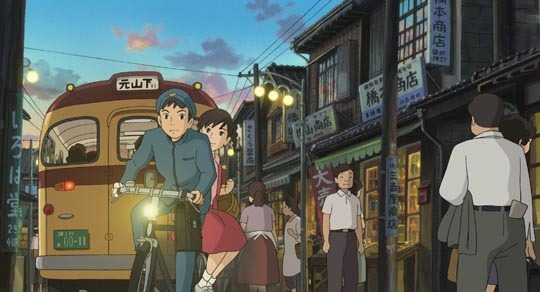 From Up On Poppy Hill is as visually rich as any previous Ghibli production, the intensity of the colours and the details of the set design giving it a combination of realism and the heightened quality of memory fuelled by intense emotion. 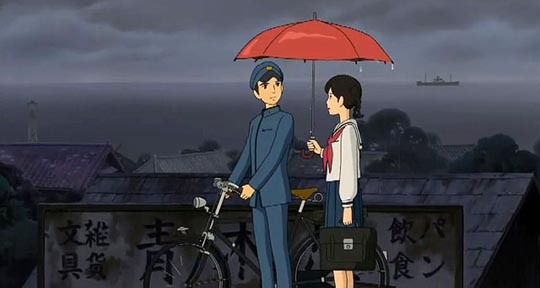 The romance between Umi and Shun, which itself becomes complicated through shadows cast by the chaos and trauma of the war, is delicate and convincing; the deeper themes of the movie are balanced with comic details supplied by the large cast of supporting characters; and every moment seems visually breathtaking. 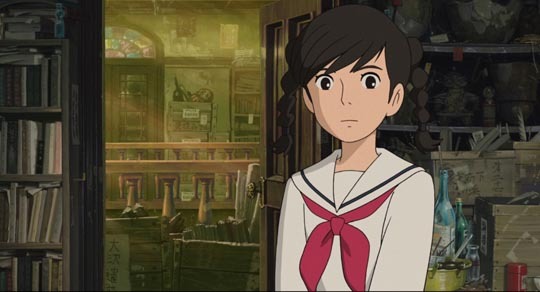 This is the second feature to be directed by Miyazaki’s son Goro, after the disappointing Tales From Earthsea (2006). 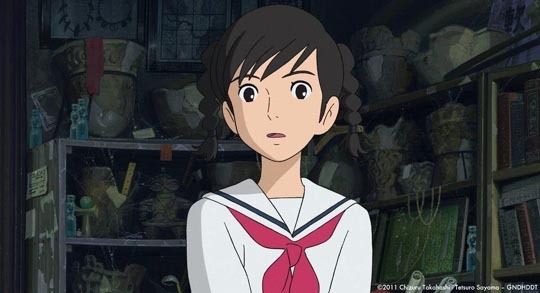 That earlier movie tried too hard to emulate Miyazaki’s own films, both in design and tone, resulting in a pale imitation and weak storytelling. With Poppy Hill, Goro comes into his own, revealing a greater affinity for the small, realistic narrative with a real-world setting. If at times the animation itself seems a little sketchy, this is explained in some of the disk’s extras, as the crew struggled to complete the film during the national trauma of the devastating earthquake and tsunami of March 2011. But overall, the film is beautifully designed and animated. From Up On Poppy Hill is available in a Blu-ray/DVD Combo Pack and as a stand-alone DVD. The Blu-ray’s HD encoding makes the film’s colours pop off the screen, giving the hand-drawn images a remarkable degree of depth. There’s so much detail in the cluttered interiors of the clubhouse that it’s tempting to pause the film just to explore the backgrounds. The audio comes in both the original Japanese and the U.S. English dub (the disk’s default option), both in Dolby Digital 5.0. The mix is rich with detail which adds to the sense of realism, with a varied music score which incorporates period pop songs, elements of jazz, and some new ballads. Obviously, it’s preferable to watch the film with the original language track as the English dub all but erases the Japanese identity of the story, which after all is crucial to the film’s meaning. As happens all too often with Ghibli films, the dub track is heavily loaded with well-known names which may be seen as a marketing necessity, but becomes a distraction as you find yourself trying to figure out which character is being voiced by Gillian Anderson, which by Bruce Dern. In Japanese, all you’re aware of is the characters, not the performers. The disk also offers two subtitle tracks, or rather one subtitle and one dubtitle (a transcription of the English dialogue for the deaf and hearing-impaired). There are significant differences between the two, starting with Umi’s opening voice over which is only present on the English track, quickly setting up the character, the location and the background of the story, after which the narration vanishes completely. But more significantly, the subtitle track often seems sketchy and lacking in nuance, paradoxically giving the impression that the English script is richer and more poetic than the original Japanese. There are many odd little differences: when Shun turns up with a bandaged hand, in the subtitles he says he was “scratched by a cat”, on the English track and dubtitles, he says he “cut myself shaving”; in the subtitles, he says he lives “near the docks”, but in English it’s “downtown”. But where this really becomes problematic is when the kids go to see the president of the board to argue against the demolition of the clubhouse. In the subtitles, Umi says only that “we cleaned it up”, which makes the emotional looks she gets from the two boys with her and the president seem oddly intense; but on the English track she argues that the clubhouse is important because “we need to be connected to the past”, a point which finally sways the president. As I don’t speak Japanese, I can’t say which titles are the more accurate, but the dubtitles do seem to offer a more nuanced translation. 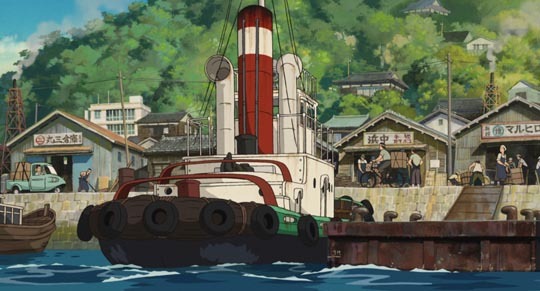 The disk offers a variety of supplements which give some context to the production, starting with a complete animatic storyboard (1:30:51) accompanied by the English soundtrack; an interview with Goro Miyazaki (17:37) in which he discusses the relationship between the real historical Yokohama and the imagined narrative space of the movie; a featurette on Yokohama (22:36); a featurette on the English voice recording sessions (21:48); a video of the theme song which includes some fascinating archival footage of Yokohama in the ’60s (5:45); a collection of Japanese trailers and TV spots (7:11) and the U.S. trailer (2:25). There’s also a press conference in which Hayao Miyazaki discusses the decision to keep working on the film as the country was reeling from the earthquake and tsunami (39:33); and a brief (6:14) video clip from the first screening of the finished film for the crew. Oddly, after praising everybody for their work in completing the film under stressful conditions, Miyazaki abruptly launches into a rather fierce critique of everything that’s wrong with the film in terms of weak and sloppy animation; following this Goro gets up and thanks everyone, taking full personal responsibility for all the feature’s failings. This puts quite a damper on what at first seems like a celebratory moment, and certainly a general audience is unlikely to be as critical as the master animator. 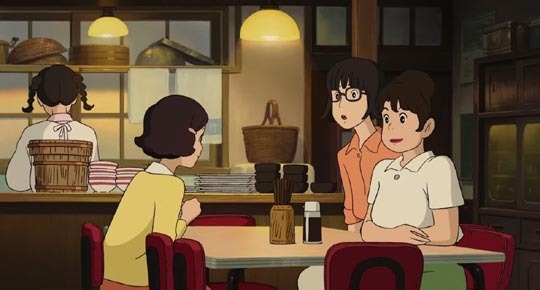 Poppy Hill was well reviewed and became a hit in Japan. This entry was posted in Review and tagged Animation, Blu-Ray, Directors, Hayao Miyazaki, Japanese Film, Review. Bookmark the permalink.